A sunny day dawned after the wind and rain of the preceding week, and this encouraged a good turn-out for the April meet. We all gathered at Highlands College car park, apart from Peter (I’m running late) Kinley whom we picked up later en route. 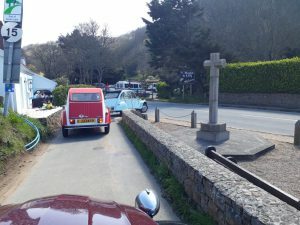 Clive produced and impressed with his mini-me electric 2CV which strutted its stuff around the rarely empty car-park. 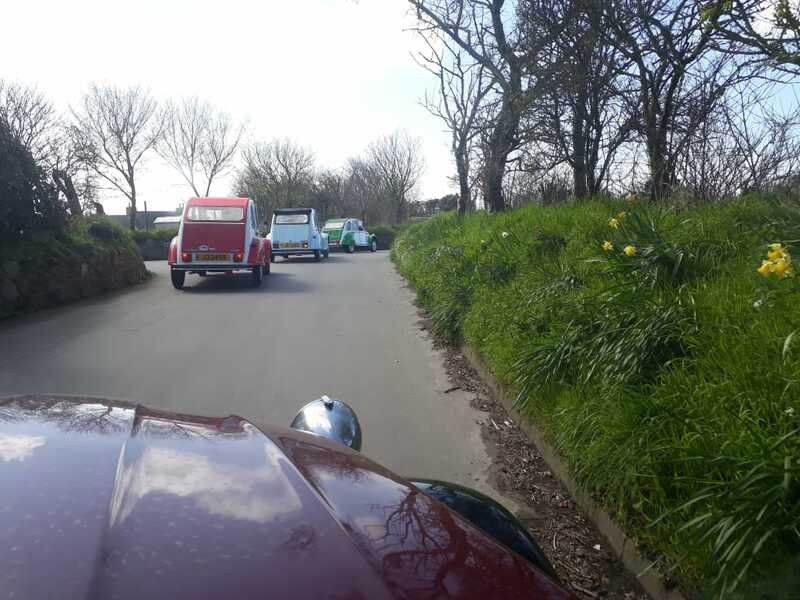 A reluctant Fast Eddie took the lead – persuaded by the rest of the group as he always chooses a good road – in Noddy. 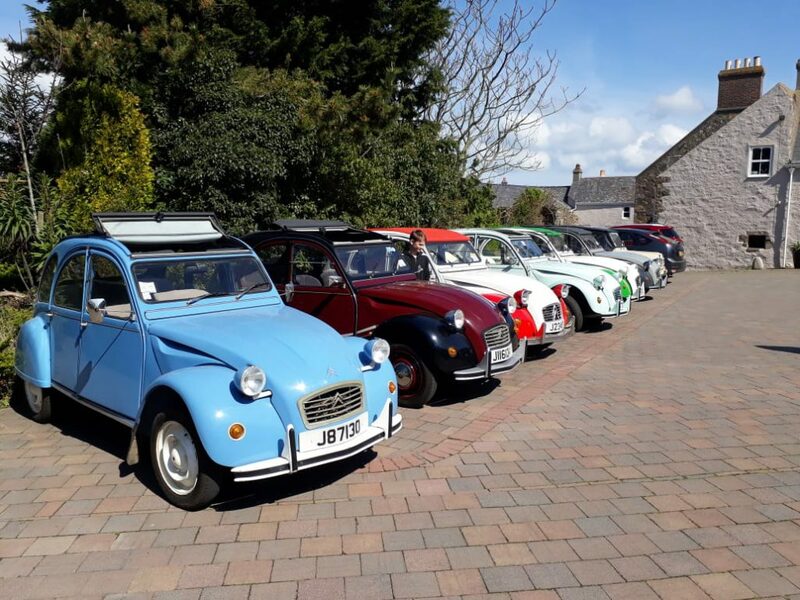 The cars with their palette of multi colours made a great picture as we winded through the lanes of St Saviour, via Bon Air Lane, St Saviour’s Hill, La Rue de la Deloraine, La Rue a la Dame and onwards up to Trinity Arms. This was when it turned into a bit of a Scavenger Hunt ‘a la Anneka Rice’. Jac and DT were in Blanche, and Blanche decided she fancied a quick half in the pub and refused to move off from the yellow line. There was a distinct ‘air de petrol’ so along came the fleet Dr Chris in Buzzy Bee to see what was afoot. It was time for a push to the side and bonnet up. Oh dear Blanche, this is so unlike you! Meanwhile, Fast Eddie had turned back to try to find the trailing 7 cars but couldn’t remember the route he had taken so he returned to his group & they carried on without us. Clive took on the lead for group two, leaving Blanche and Buzzy Bee to have a chat on the roadside. This is when a team walkie-talkie would have come into its own. Helen in Scarlet had decided to throw her mobile in the washing machine that morning, so she was out of contact, and therefore Allen with the Stig’s neck in Millie called Ben in Scarlet to trace the pack. Ben actually answered his phone! Meanwhile Chris had knocked up Blanche’s carburetor and they were back on the road, and a message came through from Peter Kinley that he had managed to get to the La Fontaine car park to meet up with us all. Frantic calls from Millie to Blanche and Scarlet resulted in a chosen rendez-vous at La Fontaine. When Clive’s group arrived there, Clive and Cassis cruised on through towards Sorel, oblivious to the arrangement behind, so Millie and Titinne swung right into the carpark and rendez-voued with Peter. Within no time Fast Eddie was flying along La Route du Nord and Millie, Titinne and Peter managed to slot into the group and re-join the drive. The nine of us had a lovely meander through St John and St Mary and down the steep track to Greve de L’Ecq past the firing range. Rick’s blue Cecile (soon to have a name sticker on the bonnet flap) looked stunning in the sunshine, and was obviously enjoying a rare expedition. 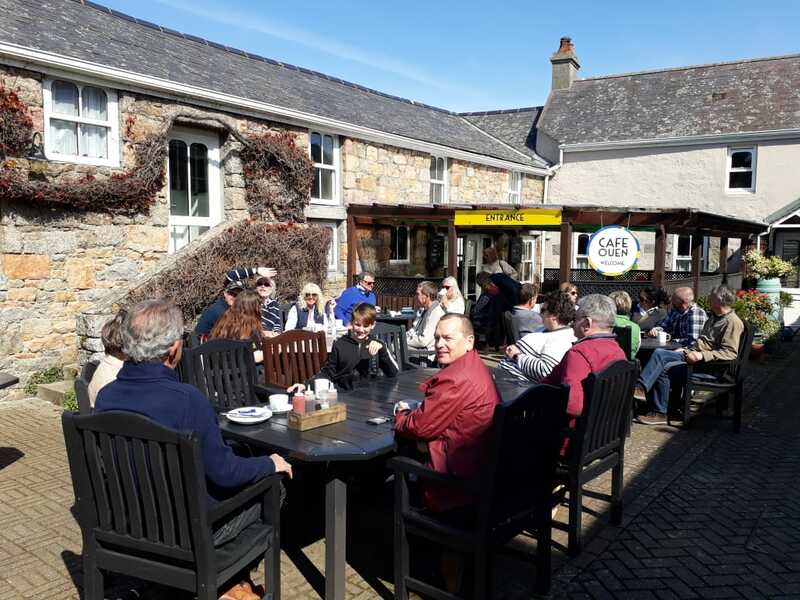 We had our final stop at Café Ouen and sat in a large group outside in the sunshine, trying to decide whether it was a hot chocolate or a cold beer stop. A great drive and a brilliant turn-out – even though we went our separate ways for most of it! Blanche has been well and truly chastised! It was a bit disjointed but was fun & nice to see so many cars, ‘Joseph’s techni coloured dream coat’ Pfffft! Lovely to sit in the sun just chatting. Glad to hear that ‘Blanche’ is back in ship shape order.